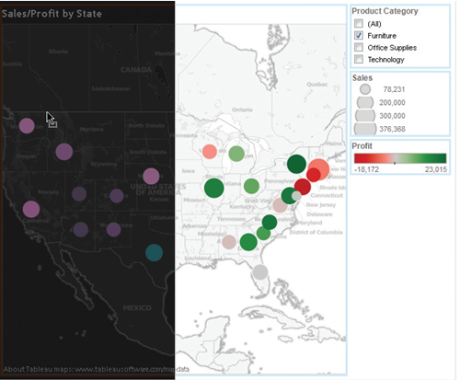 Through this section of the Tableau tutorial you will learn how to create a Tableau dashboard, what is tiled and floating placement, advanced dashboard elements, layout container, dashboard actions and more. click the New Dashboard tab along the bottom of the workspace, or choose Dashboard | New Dashboard from the drop-down menus. 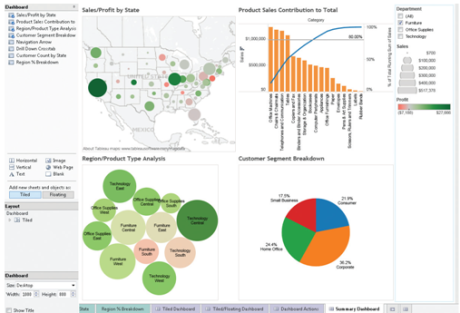 A blank dashboard will appear with the Data window replaced by four sections: a list of existing worksheets in the workbook, a selection of additional dashboard elements a layout section containing the organization of items added to the dashboard, and a sizing section for customizing dashboard element sizes. 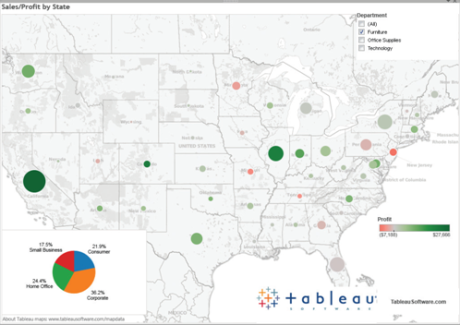 Learn more about Tableau in this insightful blog now! This default setting uses the same dashboard design approach as previous versions of Tableau, placing worksheets and their associated elements (captions, quick filters, and so forth) in a strict “no-overlap” order on the dashboard. 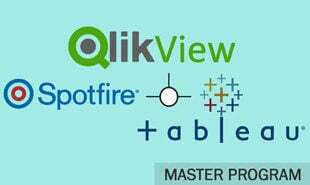 The most basic way to use tiled placement is to simply double-click on worksheet names in the order you want to add them to the dashboard. Tableau will add each worksheet to the dashboard in a side-by-side, then top-and-bottom order. You can also drag and drop worksheets from the worksheet list onto the dashboard. While resulting placement of new views can seem confusing if you’re just getting usedto dragging and dropping sheets, there are a few tips that will help you master exactly where the sheet you are dragging will appear in relation to existing sheets. A large gray box indicates that the sheet will split the dashboard in half vertically or horizontally. A thin gray box (typically at the very edge of the dashboard, but also between legends and worksheets) indicates that the sheet will take up that entire portion of the dashboard, resizing all other dashboard elements to accommodate it. A medium gray box indicates that the sheet will be placed in between the two elements on either side, resizing the other two elements to accommodate it. Once you’ve placed a worksheet on the dashboard, you can move it to a differentlocation. When you select the desired sheet on the dashboard, you’ll notice the smallseries of white dots at the top of the title bar (known as a “move handle”). Hold yourmouse down on the move handle and drag the sheet to the desired location. After clicking the Floating button under “Add new sheets and objects as,” worksheets can be freely placed anywhere on the dashboard. If the worksheet includes legends, quick filters, or a caption, these items will also be placed on the dashboard as free-form elements. Once they have been dropped, worksheets and their associatedelements can be freely moved and resized without limitation. An immediate benefit of floating placement is the ability to move legends on top of existing worksheets that may have blank areas, such as maps. If you already have existing tiled worksheets on the dashboard, floating worksheets will always appear on top of them. If you have multiple floating worksheets, you can choose the floating order, placing one object on top of or behind other floating objects. Select the desired floating sheet on the dashboard and click the context arrow in the upper right of the title bar on the object, and make the desired floating-order choice from the context menu. These additional elements permit text and images to be placed on the dashboard, as well as additional items to support web pages within dashboards, blank objects for spacing, and containers to help further refine the way a dashboard is organized. 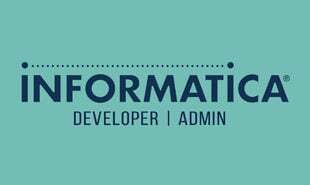 In addition, the Layout and Size sections provide various ways of interacting with and customizing your dashboard. 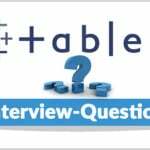 Looking for top jobs in tableau ? This blog post gives you all the information you need! A layout container is an outline or box that contains other objects, such as worksheets, legends, and quick filters. The main benefit of a layout container is automatic resizing of objects within it. If, for example, a quick filter changes the size of a worksheet in a container (perhaps a crosstab shows fewer rows), the other objects in the container will automatically resize to accommodate the smaller worksheet. From a worksheet’s context menu (click the context arrow in a worksheet’s title bar), choose Select Layout Container. This will highlight the layout container that the worksheet is contained within. Examine the Layout section of the dashboard window on the left side of the screen (covered in more detail later in the chapter). This section outlines the layout container hierarchy of the dashboard, indicating how many layout containers there are, whether they are horizontal or vertical, and what dashboard elements are contained within them. Another dashboard element that’s primarily intended for tiled dashboards is the blank.When dragged to a dashboard and sized to a desired width or height, this element simply inserts white space that can be used to separate dashboard elements from each other. In addition to individual worksheet titles (which appear automatically when a worksheet is added to a dashboard), as well as an overall dashboard title that can be displayed by way of the Dashboard | Show Title drop-down menu item, you can add additional text by dragging this item from the left side of the dashboard window. When you drop the text element, an Edit Text dialog box will appear allowing you to type and format text, including adding predefined dashboard fields from the Insert dropdown menu. Text can be added in either tiled or floating mode. In tiled mode, text will exhibit the same “gray box” behavior as other dashboard elements when being placed or moved on the dashboard. Also usable in tiled or floating mode, a bitmap graphic can be added to your dashboard by dragging Image from the left of the dashboard window. Once dropped on the dashboard, a dialog box will appear prompting for the choice of an image file from a local or network drive. Navigate to the desired folder and select an image file. You can also type in a full URL to an image on a web server. 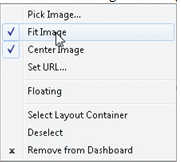 Once an image has been added, you can change or format the image by right-clicking on the image on the dashboard or right-clicking on the image item in Layout. A web page can be embedded in a dashboard by dragging Web Page from the left side of the screen. A URL prompt accepts any standard web page address. All typical web page interactivity, such as hyperlinks, is available on the web page in the dashboard. 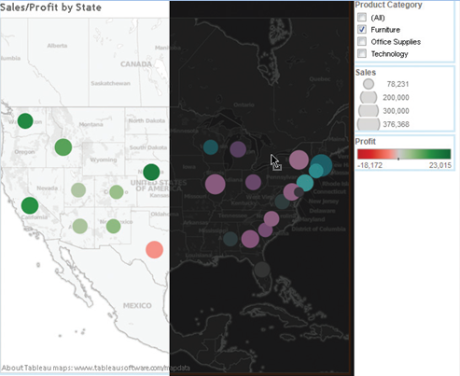 Tableau provides flexible interactivity in your dashboards beyond the default tooltipsthat appear when you hover your mouse over worksheet marks. This interactivity is supplied via dashboard actions, interactive settings that allow you to highlight, filter, and navigate from any mark on any worksheet on your dashboard. Highlight Highlight matching marks on one or more sheets in the dashboard. Filter Filter one or more sheets on the dashboard based on a chosen mark, or navigate to another sheet or dashboard in the workbook. 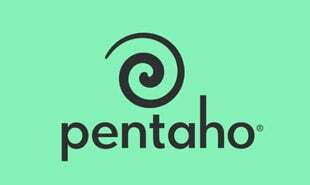 URL Navigate to a web page. Optionally, pass selected information from the worksheet to the URL to personalize it. Hover Simply hover your mouse over a mark. Select Click on a mark. 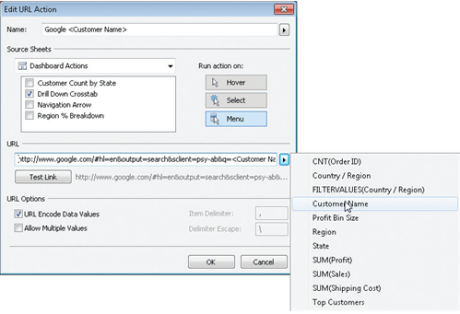 Menu Choose the option from the tooltip or right-click context menu. select Dashboard | Actions from the drop-down menus. The Actions dialog box will appear. Click the Add Action button and choose Highlight from the pop-up menu. From the Edit Highlight Action dialog box, select the method of initiating the action (hover, select, or menu). 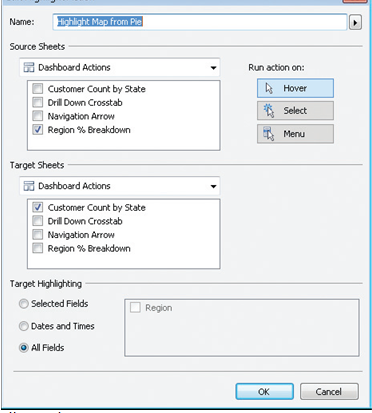 In the Source Sheets section of the dialog box, choose one or more worksheets that you want the action to occur on. In the Target Sheets section, choose one or more worksheets that you want to be highlighted based on the selected mark in the source sheet or sheets. There should be a common dimension in source and target sheets, or highlighting won’t have the desired effect. Filter actions can be created directly from a worksheet’s context menu, or from the Dashboard | Actions dialog box discussed earlier. Decide which sheet you want to act as the filter source. Select the context menu in the title bar (or right-click on the desired sheet in Layout) and check Use As Filter from the context menu. Thereafter, when you click on any mark in the source sheet, all other sheets on the dashboard will be filtered to only show values matching what you clicked on the source sheet. Choose the same context menu and uncheck Use As Filter if you want to turn this option off. When you use the context menu option, a “generated” filter action will appear in the Dashboard | Actions dialog box. If you want to remove or customize the generated filter action, make choices from the Actions dialog box. You can also create new filter actions directly from this dialog box.URL Action:A URL action allows a web page to be launched from within your dashboard. Furthermore, any field in use on the source worksheet can be used to customize the URL. 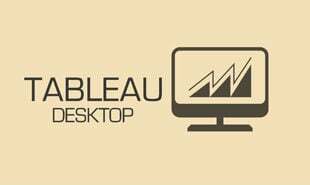 This permits Tableau to display custom web pages from the Internet or to integrate with other web-based systems in your organization. 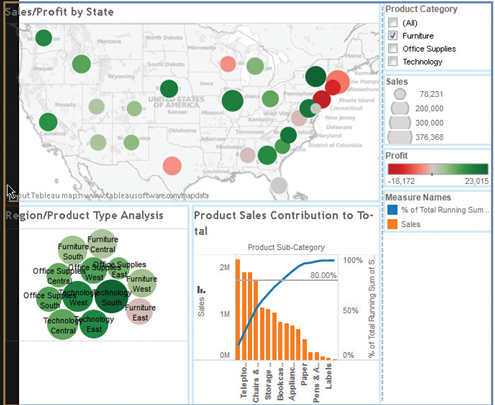 "0 Responses on Creating Dashboards"
Sign Up or Login to view the Free Creating Dashboards.